Here’s another great salad recipe for the summer! We were introduced to Kelp Noodles at a friend’s gathering, and she actually made this dish for us. (All the credit goes to her for this recipe!) We love the refreshing, half crunchy, half chewy texture and its got incredible ability to soak up any sauce or dressing you put in it. It’s versatile enough to be put into soup/broth, stir fry or into salads. Not to mention it’s made of kelp which is mineral rich and SO good for you. Oh and did I mention there’s only 6 calorie per serving? SIX!!! 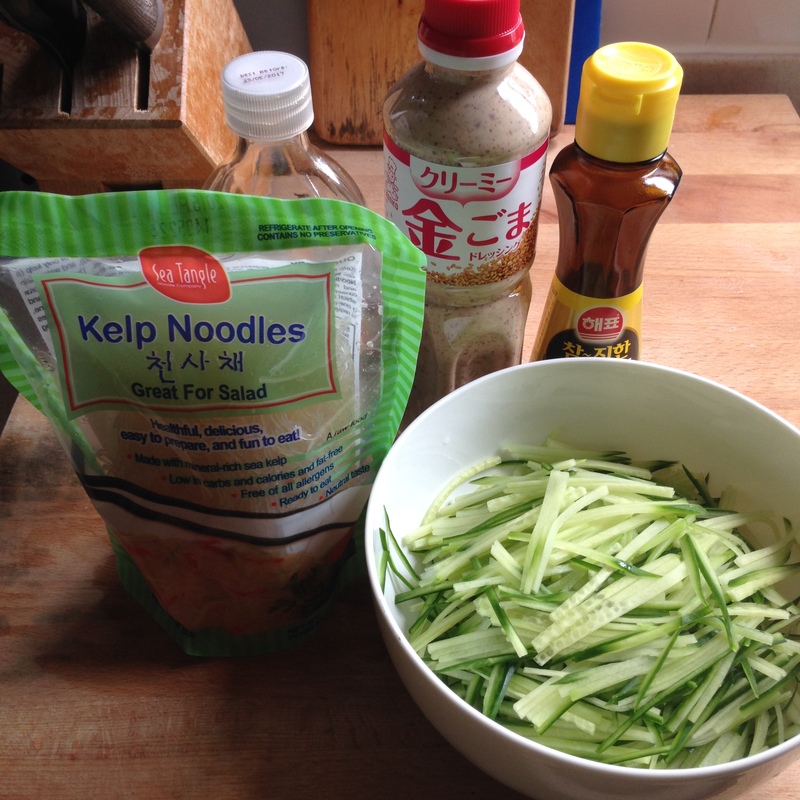 The noodle is only made of three ingredients:Water, Kelp and Sodium Alginate (made from brown seaweed). I buy them in packets online but they’re quite often sold out, so it makes them even more of a treat when I do get my hands on them! They come in little packets and all you have to do is give them a little rinse under some water, and you’re ready to cook it. Here’s the recipe to the wonderful and nutritious salad, I hope you guys will like it as much as we do! 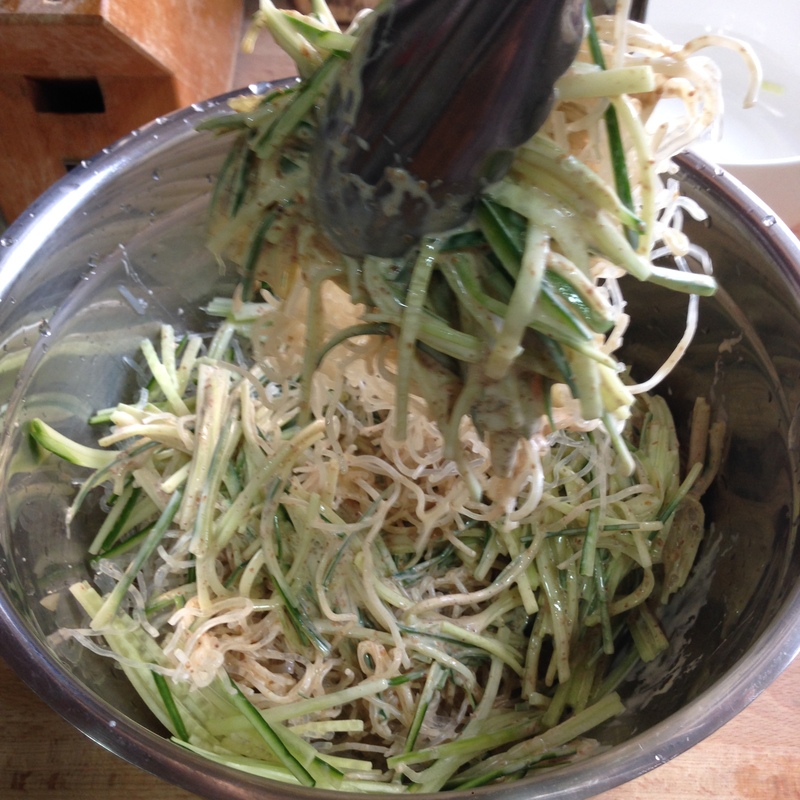 Step 2) Rinse the kelp noodles under running water, drain and put into a bowl with the cucumbers and chicken. 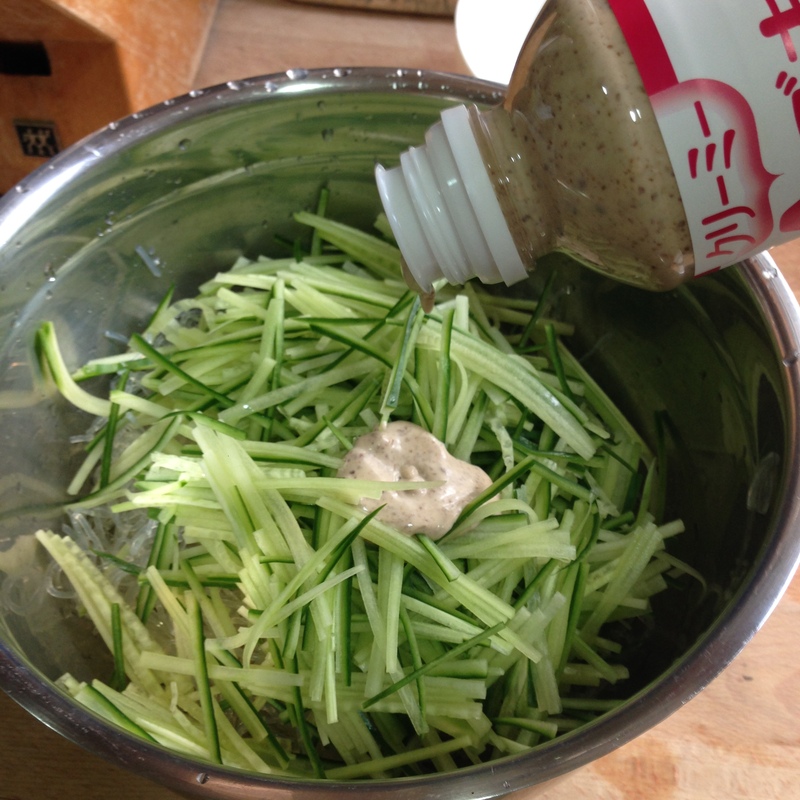 Add 3 tbls of Sesame dressing, 1/2 tsp of sesame oil and 1 tsp of white vinegar. Toss and taste. At this point, taste the salad to see if you need more dressing, or acidity (vinegar) or more salt and pepper. Add in a little bit of a time and mix to taste. You can also sliced up some red chili to add some heat to the salad. But that’s it, so simple and easy to do!